American test pilot astronaut 1962-1967. First American to walk in space. Died in on-pad fire of Apollo 1. Status: Deceased; Active 1962-1967. Born: 1930-11-14. Died: 1967-01-27. Spaceflights: 1 . Total time in space: 4.08 days. Birth Place: San Antonio, Texas. Educated West Point; Michigan. USAF test pilot. PERSONAL DATA: Born in San Antonio, Texas, on November 14, 1930. Died January 27, 1967, at NASA Kennedy Space Center, Florida, in the Apollo spacecraft fire. He is survived by his wife Patricia and their two children. EDUCATION: Bachelor of Science degree from United States Military Academy; Master of Science degree in Aeronautical Engineering, University of Michigan. ORGANIZATIONS: Associate member of Institute of Aerospace Sciences; Member of Sigma Delta Psi, athletic honorary; and Member of Tau Beta Pi, engineering honorary. AWARDS: Posthumously awarded the Congressional Space Medal of Honor. SPECIAL HONORS: Golden Plate Award; Honorary Doctorate degree in Astronautics, University of Michigan; NASA Exceptional Service Medal and Senior Astronaut Wings; Medalha Bandeirantes va Cosmonautica; Firefly Club Award; Ten Outstanding Young Men of the Nation for 1965; Five Outstanding Young Texans for 1965; The John Fitzgerald Kennedy Trophy; Aerospace Primus Club; 1966 Achievement Award, National Aviation Club; General Thomas White Award. EXPERIENCE: White, an Air Force Lieutenant Colonel, received flight training in Florida and Texas, following his graduation from West Point. He then spent 3-1/2 years in Germany with a fighter squadron, flying F-86s and F-100s. He attended the Air Force Test Pilot School at Edwards Air Force Base, California, in 1959. White was later assigned to Wright-Patterson Air Force Base, Ohio, as an experimental test pilot with the Aeronautical Systems Division. In this assignment he made flight tests for research and weapons systems development, wrote technical engineering reports, and made recommendations for improvement in aircraft design and construction. He logged more than 3,000 hours flying time, including more than 2,200 hours in jet aircraft. NASA EXPERIENCE: White was named as a member of the astronaut team selected by NASA in September 1962. He was pilot for Gemini 4, which was a 66-revolution, 4-day mission that began on June 3, and ended on June 7, 1965. During the third revolution, he carried out the first extra vehicular activity in the United States manned space flight program. He was outside Gemini 4 for 21 minutes, and became the first man to control himself in space during EVA with a maneuvering unit. Other highlights of the mission included cabin depressurization, opening of cabin doors, and 12 scientific and medical experiments. He received the NASA Exceptional Service Medal and the U.S. Air Force Senior Astronaut Wings for this Flight. On March 21, 1966, he was named as one of the pilots of the AS-204 mission, the first 3-man Apollo flight. Lieutenant Colonel White died on January 27, 1967, in the Apollo spacecraft flash fire during a launch pad test at Kennedy Space Center, Florida. BIRTHPLACE AND DATE: White was born November 14, 1930, in San Antonio, Texas. EDUCATION: Bachelor of Science degree from the United States Military Academy in 1952. Master of Science degree from the University of Michigan in 1959., Honorary Doctorate in Astronautics from the University of Michigan in 1965. EDUCATION: White received flight training in Florida and Texas, then spent three years in Germany with an Air Force fighter squadron, flying F-86 and F-100 fighter-bombers. In 1959 he attended the Air Force Test Pilot School at Edwards Air Force Base, California, and later was assigned to Wright-Patterson Air Force Base, Ohio, as experimental test pilot with the Aeronautical System Division. NASA selected White as an astronaut in 1962. He and Commander James A. McDivitt were assigned to the four-day Gemini 4 mission that launched on June 3, 1965. On the first day of the flight, White made America's first spacewalk, a 21-minute EVA during which he manoeuvred on the end of a 25-foot tether using a hand-held gas gun. During the remainder of the flight, McDivitt and White completed twelve scientific and medical experiments. 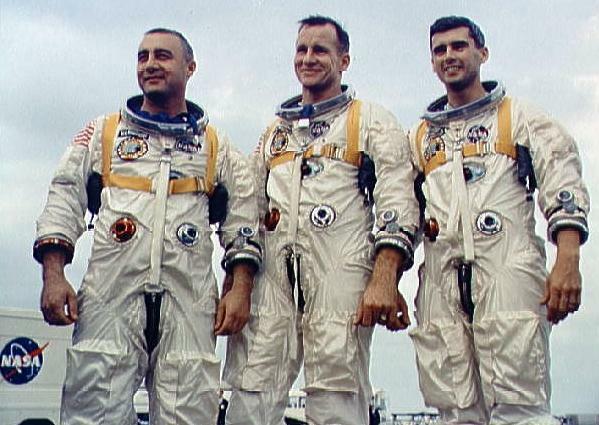 White and fellow Apollo 1 astronauts, Gus Grissom and Roger Chaffee, died in a spacecraft fire during a launch pad test on Jan. 27, 1967. AWARDS AND HONORS: Air Force Commendation Medal; NASA Exceptional Service Medal; Arnold Air Society JFK Trophy for 1966; Air Force Systems Command Aerospace Primus Club Award; General Thomas D. White United States Air Force Space Trophy for 1965; selected one of the Ten Outstanding Young Men of America in 1965. Family: Astronaut. Country: USA. Spacecraft: Gemini. Flights: Gemini 4, Gemini 7, Apollo 204. Agency: USAF. Bibliography: 6195. 1930 November 14 - . Birth of Edward Higgins II 'Ed' White - . Nation: USA. Related Persons: White. American test pilot astronaut 1962-1967. First American to walk in space. Died in on-pad fire of Apollo 1. 1 spaceflight, 4.1 days in space. Flew to orbit on Gemini 4 (1965)..
1962 April 18 - . NASA announced that applications would be accepted for additional astronauts until June 1, 1962. - . Nation: USA. Related Persons: Armstrong, Borman, Conrad, Lovell, McDivitt, See, Stafford, White, Young. Spacecraft: Gemini. NASA planned to select five to ten astronauts to augment the seven-member Mercury astronaut team. The new pilots would participate in support operations in Project Mercury and would join the Mercury astronauts in piloting the two-man Gemini spacecraft. To be chosen, the applicant must (1) be an experienced jet test pilot and preferably be presently engaged in flying high-performance aircraft; (2) have attained experimental flight test status through military service, aircraft industry, or NASA, or must have graduated from a military test pilot school; (3) have earned a degree in the physical or biological sciences or in engineering; (4) be a United States citizen under 35 years of age at the time of selection, six feet or less in height; and (5) be recommended by his parent organization. Pilots meeting these qualifications would be interviewed in July and given written examinations on their engineering and scientific knowledge. Selected applicants would then be thoroughly examined by a group of medical specialists. The training program for the new astronauts would include work with design and development engineers, simulator flying, centrifuge training, additional scientific training, and flights in high-performance aircraft. 1962 September 11 - . NASA Astronaut Training Group 2 selected. - . Nation: USA. Related Persons: Borman, Conrad, Lovell, McDivitt, See, Stafford, White, Young. The group was selected to provide pilots for the Gemini program and early Apollo missions.. Qualifications: Test pilot status (either military, NASA, or aircraft industry), qualified jet pilot with minimum 1,000 flight-hours, under 35 years old, under 183 cm height, excellent health. US citizen.. 253 applicants survived initial NASA screening of their records. Following physical and psychiatric tests, nine were selected. Eight made it to space (See was killed in a T-38 crash before his first spaceflight). This was generally considered the highest quality group of astronauts ever selected. They would command the missions during the glory days of the American space program - Gemini, Apollo, and Skylab. Young was the only astronaut to fly Gemini, Apollo, and the Shuttle program. Armstrong was the only one to fly the X-15, Gemini, and Apollo. Conrad was the only one to fly Gemini, Apollo, and Skylab. 1962 September 17 - . Nine new astronauts named - . Nation: USA. Related Persons: Armstrong, Borman, Conrad, Lovell, McDivitt, See, Stafford, White, Young. Spacecraft: Gemini. NASA's nine new astronauts were named in Houston, Tex., by Robert R. Gilruth, MSC Director. Chosen from 253 applicants, the former test pilots who would join the original seven Mercury astronauts in training for Projects Gemini and Apollo were: Neil A. Armstrong, NASA civilian test pilot; Maj. Frank Borman, Air Force; Lt. Charles Conrad, Jr., Navy; Lt.Cdr. James A, Lovell, Jr., Navy; Capt. James A. McDivitt, Air Force; Elliot M. See, Jr., civilian test pilot for the General Electric Company; Capt. 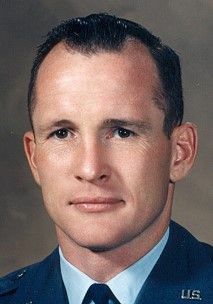 Thomas P. Stafford, Air Force; Capt. Edward H. White II, Air Force; and Lt. Cdr. John W. Young, Navy. 1963 January 26 - . Manned Spacecraft Center announced specialty areas for the nine new astronauts. - . Nation: USA. Related Persons: Armstrong, Borman, Conrad, Lovell, McDivitt, See, Stafford, White, Young. Spacecraft: Gemini, Gemini ECS. Manned Spacecraft Center announced specialty areas for the nine new astronauts: trainers and simulators, Neil A. Armstrong; boosters, Frank Borman; cockpit layout and systems integration, Charles Conrad, Jr.; recovery systems, James A. Lovell, Jr.; guidance and navigation, James A. McDivitt; electrical, Sequential, and mission planning, Elliot M. See, Jr.; communications, instrumentation, and range integration, Thomas P. Stafford; flight control systems, Edward H White II; and environmental control systems, personal and survival equipment, John W Young. New assignments for the seven original astronauts - . Nation: USA. Related Persons: Armstrong, Borman, Carpenter, Conrad, Cooper, Glenn, Grissom, Lovell, McDivitt, Schirra, See, Shepard, Slayton, Stafford, White, Young. Program: Apollo. Spacecraft: Gemini. MSC announced new assignments for the seven original astronauts: L. Gordon Cooper, Jr., and Alan B. Shepard, Jr., would be responsible for the remaining pilot phases of Project Mercury; Virgil I. Grissom would specialize in Project Gemini; John H. Glenn, Jr., would concentrate on Project Apollo; M. Scott Carpenter would cover lunar excursion training; and Walter M. Schirra, Jr., would be responsible for Gemini and Apollo operations and training. As Coordinator for Astronaut Activities, Donald K. Slayton would maintain overall supervision of astronaut duties. Specialty areas for the second generation were: trainers and simulators, Neil A. Armstrong; boosters, Frank Borman; cockpit layout and systems integration, Charles Conrad, Jr.; recovery system, James A. Lovell, Jr.; guidance and navigation, James A. McDivitt; electrical, sequential, and mission planning, Elliot M. See, Jr.; communications, instrumentation, and range integration, Thomas P. Stafford; flight control systems, Edward H. White II; and environmental control systems, personal equipment, and survival equipment, John W. Young. 1963 May 6 - . Apollo LEM manual control simulated - . Nation: USA. Related Persons: Armstrong, Carpenter, Conrad, McDivitt, Schirra, See, White, Young. Program: Apollo. Spacecraft: Apollo LM, CSM Guidance, LM Simulator. Astronauts M. Scott Carpenter, Walter M. Schirra, Jr., Neil A. Armstrong, James A. McDivitt, Elliot M. See, Jr., Edward H. White II, Charles Conrad, Jr., and John W. Young participated in a study in LTV's Manned Space Flight Simulator at Dallas, Tex. Under an MSC contract, LTV was studying the astronauts' ability to control the LEM manually and to rendezvous with the CM if the primary guidance system failed during descent. 1964 April 24 - . Deletion of the Apollo LEM's front docking capability - . Nation: USA. Related Persons: See, White. Program: Apollo. Spacecraft: Apollo LM, LM Ascent Propulsion, LM Descent Propulsion, LM ECS, LM Hatch. 1965 March 27 - . Voskhod spacewalk film - . Nation: Russia. Related Persons: Belyayev, Leonov, White. Program: Voskhod. Flight: Voskhod 2. Spacecraft Bus: Vostok. Spacecraft: Voskhod. The Voskhod-2 cosmonauts and Kamanin see the film taken of Leonov's spacewalk. It was taken by internal and external cameras on the spacecraft, as well as by the cosmonauts. Kamanin finds the raw footage quite clear and believes a good film can be assembled from a combination of the video and film coverage. 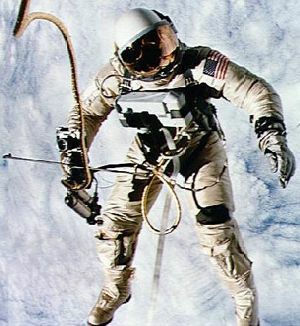 Later Kamanin hears that American Ed White will attempt to duplicate Leonov's spacewalk on the Gemini flight scheduled for 8 June 1965. In the following days the Voskhod 2 crew faces a round of press conferences, meetings with design bureaux staff. 1965 June 3 - . 15:16 GMT - . Launch Site: Cape Canaveral. Launch Complex: Cape Canaveral LC19. LV Family: Titan. Launch Vehicle: Titan II GLV. Gemini 4 - . Call Sign: American Eagle / Little Eva. Crew: McDivitt, White. Backup Crew: Borman, Lovell. Payload: Gemini SC4. Mass: 3,574 kg (7,879 lb). Nation: USA. Agency: NASA Houston. Class: Manned. Type: Manned spacecraft. Flight: Gemini 4. Spacecraft: Gemini. Duration: 4.08 days. Decay Date: 1965-06-07 . USAF Sat Cat: 1390 . COSPAR: 1965-043A. Apogee: 281 km (174 mi). Perigee: 162 km (100 mi). Inclination: 32.50 deg. Period: 88.80 min. The second manned and first long-duration mission in the Gemini program. Major objectives of the four-day mission were demonstrating and evaluating the performance of spacecraft systems in a long-duration flight and evaluating effects on the crew of prolonged exposure to the space environment. Secondary objectives included demonstrating extravehicular activity (EVA) in space, conducting stationkeeping and rendezvous maneuvers with the second stage of the launch vehicle, performing significant in-plane and out-of-plane maneuvers, demonstrating the ability of the orbit attitude and maneuver system (OAMS) to back up the retrorockets, and executing 11 experiments. The stationkeeping exercise was terminated at the end of the first revolution because most of the OAMS propellant allocated for the exercise had been used; further efforts would jeopardize primary mission objectives and could mean the cancellation of several secondary objectives. No rendezvous was attempted. The only other major problem to mar the mission was the inadvertent alteration of the computer memory during the 48th revolution in an attempt to correct an apparent malfunction. This made the planned computer-controlled reentry impossible and required an open-loop ballistic reentry. All other mission objectives were met. The flight crew began preparing for EVA immediately after terminating the stationkeeping exercise. Although preparations went smoothly, McDivitt decided to delay EVA for one revolution, both because of the high level of activity required and because deletion of the rendezvous attempt reduced the tightness of the schedule. Ground control approved the decision. The spacecraft hatch was opened at 4 hours 18 minutes into the flight and White exited 12 minutes later, using a hand-held maneuvering gun. White reentered the spacecraft 20 minutes after leaving it. The hatch was closed at 4 hours 54 minutes ground elapsed time. Drifting flight was maintained for the next two and one-half days to conserve propellant. The spacecraft landed in the Atlantic Ocean about 725 km east of Cape Kennedy - some 65 km from its nominal landing point. The crew boarded a helicopter 34 minutes after landing and was transported to the prime recovery ship, the aircraft carrier Wasp. Spacecraft recovery was completed at 2:28 p.m., a little more than 100 hours after Gemini 4 had been launched. Gemini 4 was the first mission to be controlled from the mission control center in Houston. The space walk was hurriedly included after the Russian first in Voskhod 2. White seemed to have a lot more fun than Leonov and McDivitt took the pictures that came to symbolize man in space. With this flight the US finally started to match Russian flight durations. 1965 June 3 - . 19:46 GMT - . EVA Gemini 4-1 - . Crew: White. EVA Duration: 0.0250 days. Nation: USA. Related Persons: White. Class: Manned. Type: Manned spacecraft. Flight: Gemini 4. Spacecraft: Gemini. 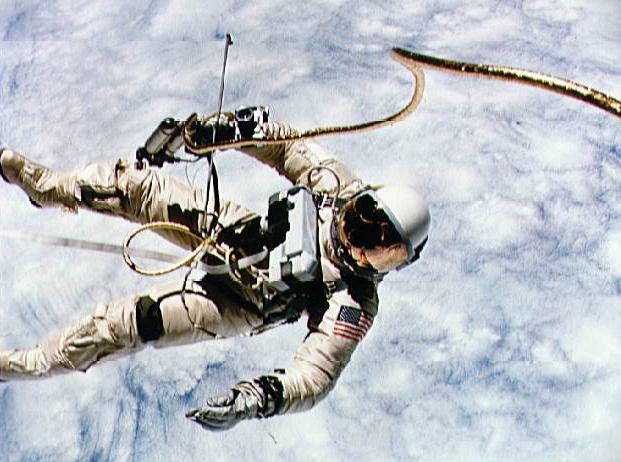 First American walk in space; tested spacesuit and ability to manoeuvre..
1965 June 7 - . Landing of Gemini 4 - . Return Crew: McDivitt, White. Nation: USA. Related Persons: McDivitt, White. Flight: Gemini 4. Spacecraft: Gemini. 1965 December 4 - . 19:30 GMT - . Launch Site: Cape Canaveral. Launch Complex: Cape Canaveral LC19. LV Family: Titan. Launch Vehicle: Titan II GLV. Gemini 7 - . Call Sign: Gemini 7. Crew: Borman, Lovell. Backup Crew: Collins, White. Payload: Gemini SC7. Mass: 3,663 kg (8,075 lb). Nation: USA. Agency: NASA Houston. Class: Manned. Type: Manned spacecraft. Flight: Gemini 6, Gemini 7. Spacecraft: Gemini. Duration: 13.77 days. Decay Date: 1965-12-18 . USAF Sat Cat: 1812 . COSPAR: 1965-100A. Apogee: 318 km (197 mi). Perigee: 217 km (134 mi). Inclination: 28.90 deg. Period: 89.90 min. An Air Force Titan II Gemini Launch Vehicle lifted Gemini 7 (GT-7) into orbit from Cape Canaveral. Astronauts Frank Borman and James Lovell completed the 14-day mission, the longest U.S. space flight to date (330 hours, 35 minutes) and 206 revolutions, and were recovered on 18 December, 700 miles southwest of Bermuda. During their record flight, Borman and Lovell piloted GT-7 as the target vehicle for the first space rendezvous between manned spacecraft. Astronauts Walter Schirra and Thomas Stafford aboard Gemini 6 were launched on 15 December and completed the first space rendezvous with Gemini 7 the same day. Primary objectives of the mission were demonstrating manned orbital flight for approximately 14 days and evaluating the physiological effects of a long-duration flight on the crew. Among the secondary objectives were providing a rendezvous target for the Gemini VI-A spacecraft, stationkeeping with the second stage of the launch vehicle and with spacecraft No. 6, conducting 20 experiments, using lightweight pressure suits, and evaluating the spacecraft reentry guidance capability. All objectives were successfully achieved with the exception of two experiments lost because of equipment failure. Shortly after separation from the launch vehicle, the crew maneuvered the spacecraft to within 60 feet of the second stage and stationkept for about 15 minutes. The exercise was terminated by a separation maneuver, and the spacecraft was powered down in preparation for the 14-day mission. The crew performed five maneuvers during the course of the mission to increase orbital lifetime and place the spacecraft in proper orbit for rendezvous with spacecraft No. 6. Rendezvous was successfully accomplished during the 11th day in orbit, with spacecraft No. 7 serving as a passive target for spacecraft No. 6. About 45 hours into the mission, Lovell removed his pressure suit. He again donned his suit at 148 hours, while Borman removed his. Some 20 hours later Lovell again removed his suit, and both crewmen flew the remainder of the mission without suits, except for the rendezvous and reentry phases. With three exceptions, the spacecraft and its systems performed nominally throughout the entire mission. The delayed-time telemetry playback tape recorder malfunctioned about 201hours after liftoff, resulting in the loss of all delayed-time telemetry data for the remainder of the mission. Two fuel cell stacks showed excessive degradation late in the flight and were taken off the line; the remaining four stacks furnished adequate electrical power until reentry. Two attitude thrusters performed poorly after 283 hours in the mission. Retrofire occurred exactly on time, and reentry and landing were nominal. The spacecraft missed the planned landing point by only 10.3 km miles, touching down on December 18. The crew arrived at the prime recovery ship, the aircraft carrier Wasp, half an hour later. The spacecraft was recovered half an hour after the crew. Far surpassing the Gemini 5 flight, Gemini 7 set a manned spaceflight endurance record that would endure for years. The incredibly boring mission, was made more uncomfortable by the extensive biosensors. This was somewhat offset by the soft spacesuits (used only once) and permission to spend most of the time in long johns. The monotony was broken just near the end by the rendezvous with Gemini 6. 1966 October 19 - . Launch Vehicle: Saturn I. 1967 January 27 - . Launch Site: Cape Canaveral. Launch Complex: Cape Canaveral. LV Family: Saturn I. Launch Vehicle: Saturn IB. Apollo 204 - . Call Sign: Apollo 1. 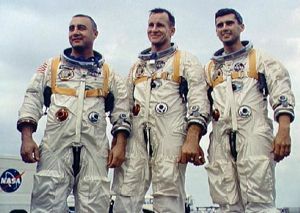 Crew: Chaffee, Grissom, White. Backup Crew: Cunningham, Eisele, McDivitt, Schirra, Schweickart, Scott. Payload: CSM-012. Nation: USA. Program: Apollo. Flight: Apollo 204. Spacecraft: Apollo CSM, Apollo Lunar Landing, CSM ECS, CSM Electrical. The first manned flight of the Apollo CSM, the Apollo C category mission, was planned for the last quarter of 1966. Numerous problems with the Apollo Block I spacecraft resulted in a flight delay to February 1967. The crew of Virgil I. Grissom, Edward H. White II, and Roger B. Chaffee, was killed in a fire while testing their capsule on the pad on 27 January 1967, still weeks away from launch. The designation AS-204 was used by NASA for the flight at the time; the designation Apollo 1 was applied retroactively at the request of Grissom's widow. 1967 January 27 - . Death of Edward Higgins White II - . Related Persons: White. American test pilot astronaut 1962-1967. First American to walk in space. Died in on-pad fire of Apollo 1. 1 spaceflight, 4.1 days in space. Flew to orbit on Gemini 4 (1965)..
1967 January 31 - . Funeral services for the Apollo 204 crewmen - . Nation: USA. Related Persons: Chaffee, Grissom, White. Program: Apollo. Flight: Apollo 204. Funeral services were held for the Apollo crewmen who died in the January 27 spacecraft 012 (Apollo 204 mission) flash fire at Cape Kennedy. All three were buried with full military honors: Virgil I. Grissom (Lt. Col., USAF), and Roger B. Chaffee (Lt. Cdr., USN), in Arlington, Va., National Cemetery; and Edward H. White II (Lt. Col., USAF), at West Point, N.Y. Memorial services had been held in Houston January 29 and 30.